Come broaden your world. Sacred Heart Global Exchange Program. Recently, 51 students in grades 8-12 participated in our global exchange program in 7 countries, and at this week's Exchange Fair, they shared their experiences with fellow ASH students as well as prospective students. Chile, France, Italy, Austria, Spain, Australia ... where would you like to go on exchange? Qualified students in grades 8-12 can take advantage of Sacred Heart's unique exchange program, staying with a host family and attending another school in the national or international Sacred Heart Network for several weeks. Past participants have attended schools in France, Chile, the U.K., Ireland, Peru, Austria, Spain and Australia. And they consistently rate the experience as one of the most formative of their young lives, in terms of broadening their perspective and building lifelong friendships. View Global Exchanges in recent years. One important component of our exchange program is reciprocity. Our Rosary students attend school and live with a Sacred Heart family in another country. Before or after her trip, the Rosary student in turn will host an international student in New Orleans. Hosting allows our students to view their own country, culture and lifestyle through the eyes of their exchange student – and costs are minimal. 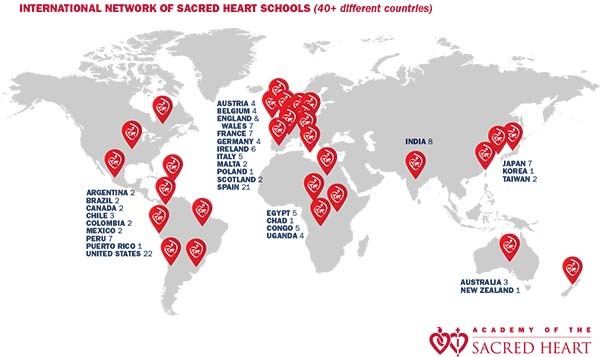 In 2006, the Network of the Sacred Heart Schools mandated that schools begin the process of integrating global education into the total Sacred Heart educational experience. The purpose of this initiative is to further our mission in creating an international character of Sacred Heart education and help to foster an important global awareness in our students as we strive to build a more just world. We do this through engaging our students and faculty in service opportunities that have a global perspective, student exchanges, liturgies, interfaith experiences, international celebrations and speakers on global issues. Academy of the Sacred Heart partners with several different International NGOs and Nonprofits that promote literacy, education, clean water, and a healthy planet. Our girls are given the opportunity to work with these partners and travel the world while giving back to those most in need. That’s how our girls change the world! How does Global Exchange work? What are the dates of travel? How long are the exchange trips? What is expected from a host family? The Society of the Sacred Heart and our RSCJ sisters are featured in a new series to build social media and leadership capacity among members of seven communities of women religious in the U.S., Africa, and Asia. Prekindergarten students initiated a Network exchange with Convent of the Sacred Heart in New York City (91st Street).